To say that the Audeze Sine lightning headphones have attracted a whole heap of praise from influential tech reviewers would be a serious understatement. Literally EVERYONE is raving about these new lightning-compatible “king cans”. PC Mag have heralded them as “powerful, vibrant, balanced, stylish and comfortable”, while Metal-Fi, called them “outstanding” and Digital Trends quite pointedly noted their ability to overcome the limitations faced by other traditional headphones on the market. Oh, and then they’ve also won the Reviewed.com Editors’ Choice Award; the CES Choice Award and the Best of CES Award (twice over). The Sine’s thus have received accolades not just from reputable audiophile publications but a diverse set of publications as well. This is good news for music lovers who listen to a wide variety of music. With an admirably high bench mark like this set, consumers should expect a mind-blowing experience from the Audeze Sine Headphones. Still, we at Lightning Cans must question, do they really live up to the overwhelming hype? The Sine’s are the epitome of beautifully engineered technology. The design of the headphones was developed in partnership with a company called Designworks, which is also a BMW subsidiary. Should we be surprised though? Audeze is known for elegent, over-engineered listening tools, which is similar to BMW’s design ethos. 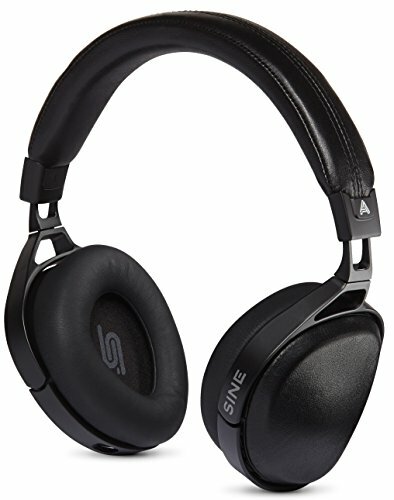 Still, the Sine’s are on the more affordable end of Audeze’s offerings. They have other technological marvels that retail much, MUCH higher, for example they have a pair of headphones that break the mould and the price ceiling with a price tag of $3,995. The Audeze Sine’s come complete with a 30-day trial on all direct sales (so that’s applicable when you purchase from the Audeze website, rather than from dealers). This is comforting as it is usually only offered when brands stand behind their products. That is reassuring as a consumer spending hundreds on a pair of headphones. There’s free shipping throughout the US, which includes Hawaii and Alaska – seems these guys are determined to bring incredible sounds to each corner of the states. The Sine headphones opt for a slick industrial style direction, and boy, are they are beautiful…or handsome..you can decide. The quality is apparent from the moment you pick the headphones up, they have a pleasant heft to them. They aren’t air light or creaky because they aren’t plastic. You notice the quality when you check out the mechanics of the low-profile matte black hinges you’ll soon discover that the movement matches, being both smooth and robust at the same time. The headband and ear cups feature a soft, pliable black leather, which aren’t only strikingly handsome, but also quite comfortable for long-term wear and are clearly durable enough to stand the test of time. Have we had more comfortable headphones? Of course. Sennheiser is the king of comfort in our opinion, but the Sine’s are more out-and-about, more travel-friendly oriented cans, compared to sit-at-home-for-hours. This solid brand/hinge construction, teamed with memory phone ear cup cushions, make the Sine headphones one of the sleekest, mobile-friendly lightning-cable cans on the market. There is no visible cabling running from the headphone speaker units though the band. On the good side this means the earphone units can swivel full 180 degrees, better conforming to the shape of your head. On the potential downside, that means you have a cable running to each side of the headphones. Personally we like this classic look. If we were so fussy about cables we wouldn’t even bother with a single cable, we’d go straight for a bluetooth option. But we don’t like bluetooth quality, so the Sine’s it is! The earphone cans themselves are adjustable from the headband to move up and down. The sliding motion is smooth but not weak. It feels like it will last for quite a while. Nothing cheap or too easily moving in/out here.. Unlike other lightning capable headphones in this class, these headphones get the ergonomics perfectly right – they’re not so tight so as to be uncomfortable after an hour or more wear, whilst they still have grip to stay secure and lightness that could make you forget that they were there at all. Balancing comfort, secure fit, and ability to wear for extended periods of time is a tricky equation to get right. Fortunately Audeze has it dialed in here. While many headphone companies reacted to Apple’s removal of the headphone jack by turning to inferior quality bluetooth, Audeze took on the challenge and embraced the new technology to produce a truly unique product. Audeze Sine’s come with a lightning-terminated cable so they work perfectly with iPhone 8s, 8+, and iPhone X models. This is a pretty special cable. We’re not talking about just any old headphone cable, we’re talking about a cable specifically designed to take advantage of the digital signal and power transmitting capabilities of a Lightning port found in Apple products. Say “hello” to the Cipher cable. The Cipher is a super fat, heavy duty, tangle free cable that not only transmits your music losslessly to your ears but also includes a built in DAC as well. We’re talking about a “system-on-a-chip inline” cable that uses the iPhones internal DAC and amplifier to directly stream 24-bit digital audio to a hi-res DAC with DSP (digital signal processor) inside the CIPHER cable itself. Additionally the cable includes a micr0phone for voice calls, full SIRI compatibility, built in DSP, and a dedicated EQ app to adjust your music to your taste directly from your smartphone. The Cipher cable is one of the stand out features of the Sines and a very practical application of the benefits afforded by using lightning connections instead of analog. All Audeze headphones feature “proprietary planar magnetic design”, which capitalizes upon super thin-film driver materials and powerful magnets. If this tech sounds like rocket science, then you wouldn’t be far wrong, as one of the founders of Audeze hails from the NASA engineering team. Anyway, back to the impact of this on the sound – ultimately this tech delivers a consistent, precise, detailed sound. From classical to rock to hip-hop the Sine’s can handle it all. Sure, they aren’t bass canons, nor will they hit high’s like a pair of hand-crafted Grados, but for everyday use on the go or in the office, the Sine’s got your back. It’s worth noting that this planar magnetic driver technology found in the Sine’s is pretty generic stuff in headphones that cost $1000 upwards, but in headphones in this price range? Well, if you find any other brands that offer this, let us know, as we’re yet to discover them. Suffice to say that the Audeze Sine headphones deliver a big, bold sound – the planar magnetic technology offers a deeper bass, and the super thin-film means that there’s little to no distortion. In terms of technology-for-dollar, you are definitely getting your worth here. The Sine offers up a wide frequency response – for you, this means regardless as to how much you crank up the treble, or how much you lower the bass, you’re still going to get a full affront of sound. Combined with quality engineering and solid build materials and you’re looking at a true swiss-army knife of iPhone-friendly audiophile listening. The Audeze headphones are all good to go with plug and play that sounds amazing. But, let’s face it, these headphones have been built for those who are serious about their music. For these people, there’s an app. This allows you to tweak two EQ pre-sets and 10 frequencies. You can easily refine the bass and tamp down highs – which is going to work like a dream on songs where previously there were peaks that you’ve always needed to address. You can also save two EQ curve pre-sets on the cable (which is perfect for when you switch between devices). The Audeze Sine headphones come with two types of cabling: traditional 3.5mm, or iPhone 7-friendly Lightning – both of which are nice and rigid (so, no more tangling – a gift from the audio gods if ever there was one). The Lightning cable features a 3-button remote and built-in mic (which is Siri compatible), and that’s just the beginning. It also accounts as the world’s first 24-bit DAC cable, which in layman’s terms means that it is the headphones that are handling the audio decoding legwork, rather than the phone. All of this translates to say that you get a boosted music quality that perfectly represents even the highest resolution of audio. *Yeah we know, we touched on this above.. but honestly, this cable plus the planar magnetic tech are two of the Sine’s most standout features and worth driving home how freaking cool they are! How sick do they look? Build quality that will last? How much would bassheads enjoy them? How much better will they make your music sound? Overall the Sine’s a truly unique, bringing Planar Magnetic technology and a really neat lightning cable to the table which is pretty empty in terms of direct competition. Sure the price is a little high, but factoring in all the engineering that has gone on to get incorporate these new technologies, it’s actually a pretty fair price we think and if we had the cheddar, we’d drop for them in an instant. Commonly priced at $449.00, The Audeze Sine Headphones aren’t your middle of the road headphones, and nor do they pretend to be. You can regularly find them on sale or discounted, so if you don’t need them now, it may be worth waiting and monitoring prices. If you’re looking for something a little more affordable but still engineered with a dedicated lightning cable so you can use them with your new iPhone, check out the Philips Fidelio M2L, which at around an average of $165 are quite a bit cheaper than the Sines and still offer solid audio quality. Likewise, the Q Adapt On Ears from Libratone are a uniquely designed set of headphones designed to work seemlessly with your iPhone via a dedicated app. They are however Bluetooth so if hifi is your thing, better off with either the Sine’s or the Fidelios, depending on your budget. 2017 RED DOT AWARD WINNER: "Outstanding sound....The materials, workmanship and technical equipment of these headphones guarantee a unique tonal and tactile experience." SUPERIOR RESOLUTION: Our innovative planar magnetic drivers use NASA material to provide lower distortion, better bass response, and clearer, more accurate sound than any other on-ear headphone. The question as to whether this price is worth it for the Sines, comes down to this: Audeze pitch themselves as a progressive, innovative brand to take earphone technology further, to push the boundaries of what’s possible. The Sine headphones tick every box of even the most demanding audiophile – for whom they have been so meticulously designed and developed for. So, are they worth it? You bet every last one of your $449 they are!